You guys remember ambrosia salad, right? 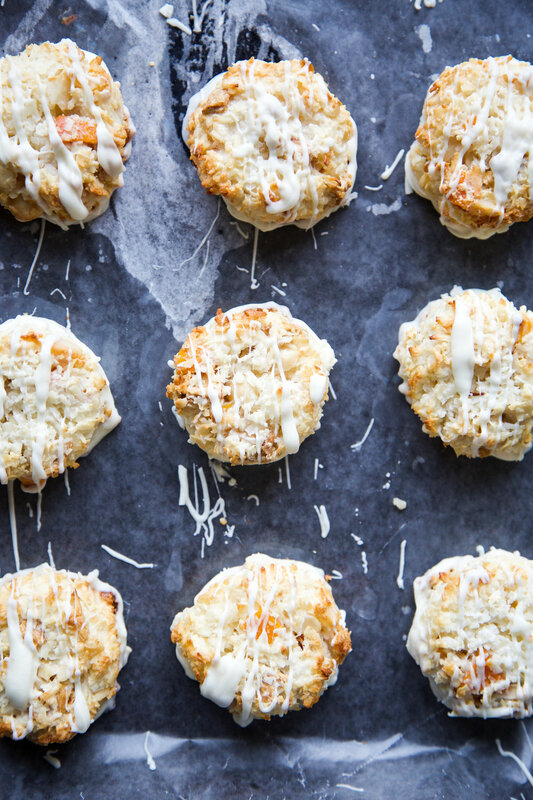 Well, if ambrosia salad and white chocolate macadamia nut cookies had a baby, on some sunny, palm tree covered island, these tropical macaroons dipped in white chocolate would be the result. Weird way to describe a cookie? Maybe, but it's 100% the truth. With summer quickly approaching, coming up with desserts that are delicious while being swimsuit safe becomes a bit of a challenge. So, what’s a girl (or guy) to do when they have sweet tooth that just won’t quit but summer is right around the corner? Macaroons, my friends, macaroons. And, more specifically, because summer, tropical macaroons dipped in white chocolate (Ok, that whole white chocolate part might not be swimsuit friendly, but we can make small exceptions, right?!). Yes, I know these cookies have sugar, and yes, I know coconut is full of fat, but, it’s the good kind of fat. And while there may be sugar, there’s no butter or flour to be found anywhere in these cookies, sooooo winning! But don't worry, just because I made these macaroons with my summer body in mind they're anything but boring. In fact, they’re incredibly moist, decadent and indulgent, and they’ve quickly risen to the list of my favorite cookies of all time (no easy feat to do). Can we say "Aloha dream cookie!"?! Make sure you head on over to Sugar & Cloth to grab the recipe and you'll be on your way to tropical paradise in no time!